MIAMI BEACH – July 16, 2018 – Baptist Health South Florida today inaugurated the much-anticipated South Beach urgent care, diagnostic and outpatient center on Alton Road. The four-story, 60,000-square-foot wellness and medical complex brings a new level of service and accessibility to health care in the southern part of Miami Beach. Baptist Health now has more than 50 outpatient centers offering a broad spectrum of health care services throughout Miami-Dade, Broward and Palm Beach counties. The outpatient center at 709 Alton Road has an urgent care center for both adults and children that is open daily from 11 a.m. to 11 p.m. The primary care component has offices for doctors, while the endoscopy center has various rooms, and the diagnostic imaging center contains services for CT and MRI scans, nuclear medicine, X-ray and ultrasound. Additionally, Miami Orthopedics & Sports Medicine Institute has a location for physical therapy for orthopedic injuries. “The center is a culmination of many years of effort by Baptist Health South Florida, our doctors and staff, and community supporters who recognized the need for a modern facility in the southern part of Miami Beach,” added Lopez-Blazquez. 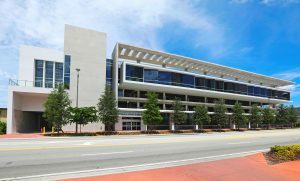 In addition to the medical facilities, the building contains a Community Resource Center for Miami Beach residents and community groups, retail space on the ground floor, two stories of parking and a rooftop terrace with a garden. The center, designed by architecture firm Perkins+Will and developed by Russell Galbut’s Crescent Heights Development, was approved by The Miami Beach city commission in July 2015. For downloadable B-Roll and images, click here.